Hello and happy Thursday, everyone! If you’re in the Portland area, I hope you enjoyed the lovely weather over the last couple of days. I know I’m re-inspired to consider spring knitting options. So, jumping right in, the first pattern I have to share today is Petrie – a free pattern by Beautia Dew that I found on Knitty. This is perfect for a spring/summer tank option, and I’m a big fan of the boatneck. It reminds me of a bit more structured version of Coco Knits’ Gretel, and Thursday by Assemblage. Can’t you just see this with a full, high waisted skirt? Done originally in a DK weight cotton, I’d really like to see it in Rowan’s Lenpur Linen (color 566 especially). Now that the giant shipment of Poetry in Stitches is behind me, I’ve had a bit more time to roam Ravelry this week in the hope of finding pattern alternatives for some of my favorite Fashion Week looks. I haven’t stopped thinking about this look from the Louis Vuitton Fall/Winter 2010 show since my last post and it’s been driving me crazy. Pretty similar to the one I found last week, this pattern would achieve the layering look a bit better, being not quite as heavy on top. Originally done in a sport weight alpaca held double, I would do the same and use Isager Alpaca 2. 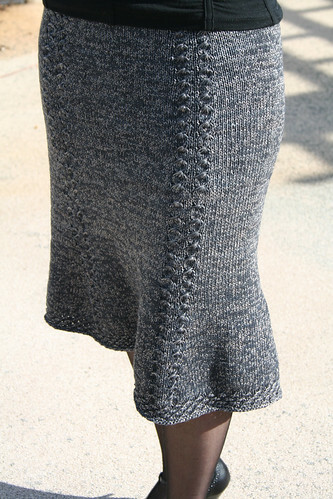 The pattern calls for a worsted weight yarn, and (since skirts have such potential to grow) I’d choose something a little sturdier and with some memory. Rowan Demin could be a great option, but I’d also be interested in seeing how Rowan Wool Cotton would hold up. I don’t know about you, but I (and most of us here at Knit Purl) were immediately obsessed with this pattern. 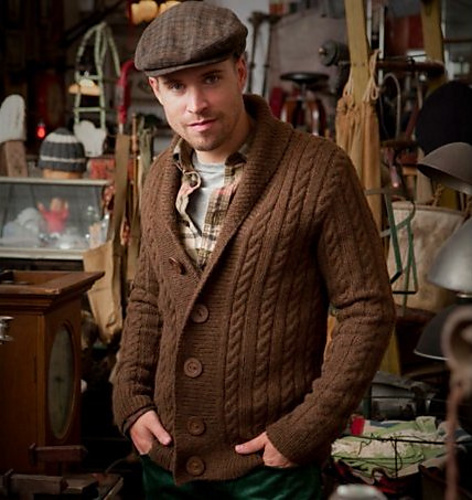 While it is a great men’s pattern, I’d make it as a weekend sweater for myself. 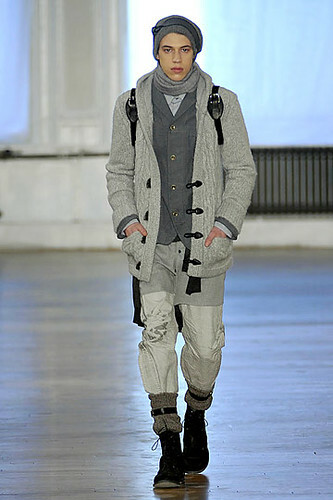 The pattern calls for Rowan Lima, which I would definitely stick with. If you haven’t worked with it yet, I highly recommend it. An 84% baby alpaca, 8% merino, and 8% nylon blend, it’s absolutely gorgeous and truly is a treat for your hands. With that I’ll have to leave you for another week, check back next Thursday for another edition of Fashionknitsta. Until then, as always, stay chic blogfans! The post Fashionknitsta Thursday: 3/25/10 appeared first on Knit Purl Blog.